You look at your phone to hail a Lyft. But, it’s a little pricier than you thought, so you check a different app for a taxi. On second thought, maybe a Car2Go would work better, so you open a third app. But there’s not one nearby. Now you’re back to square one. This may be a classic example of a first-world problem, but sometimes it can seem like there are just too many smartphone-based options to get around the city. Hoping to solve the problem is Migo, a new Seattle-based app that functions as a search engine for on-demand ride services. The company launches its service, in Seattle and Portland, on Thursday. The app, so far available only for iPhones, consolidates different ride-hailing and car-sharing services onto one screen, showing you which ones are nearest and giving a price comparison. A map shows where all nearby cars are, and price estimates will pop up for each company once you enter a destination. In Seattle, it will launch showing six different car and ride services — including Lyft, Seattle Yellow Cab and Car2Go — with plans to expand. Uber, which doesn’t want to be featured on other platforms, is not included, said Jeff Warren, Migo’s founder and CEO. Warren, a former Expedia executive, started Migo a bit over a year ago after he said he realized that although plenty of apps deliver on-demand services, there isn’t really a great way to find them. There are apps to help you move a couch across town, but search on Google for movers and you’ll find the services of companies that will help you move your whole apartment. And the one market, Warren said, that had enough different businesses offering on-demand services to warrant its own search engine was transportation. “In almost every city in the U.S. there are 9 -15 ways to get from point A to point B by using a smartphone to hail a ride,” Warren said. He said that Migo’s research has found that 80 percent of ride-hailing customers have two or three apps on their phone and actively switch between them. 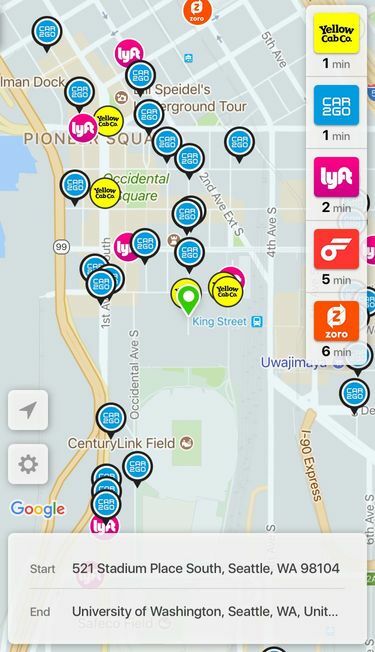 For five of the six companies it currently features in Seattle (all except Car2Go), Migo lets a user not only find a ride or a car, but hail it and pay for it within the Migo app, without opening or downloading anything else. Migo typically makes 50 cents per ride, which is paid by the company with no surcharge for the consumer, Warren said. He said the company has been in discussions with Seattle’s new bike-share companies about adding them to Migo as well.